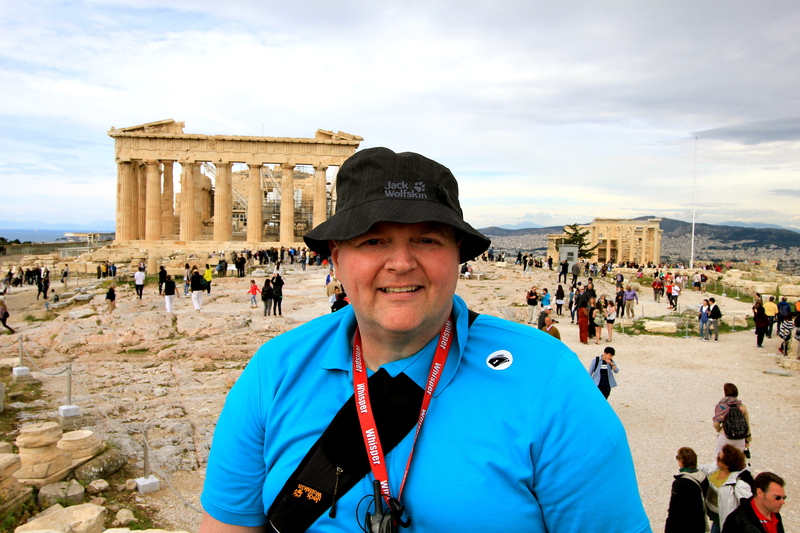 As a someone who loves history, a visit to the Acropolis of Athens has been on my bucket list! 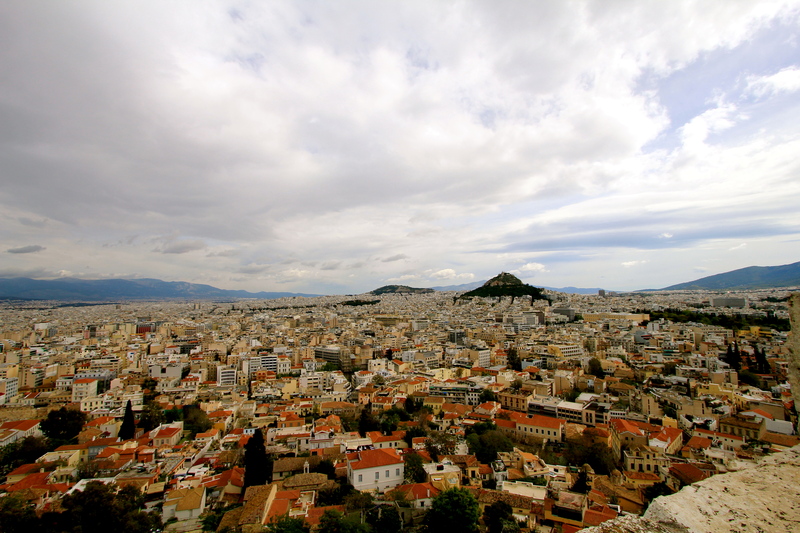 The Summer Olympics were in Athens in 2004, but other than a new tram line, there is not much to the city of Athens itself, as it and most of Greece has seen terrible unemployment recently. At 50% unemployment vs. 6.2% in the US, you can really see this as you drive through the city streets with dozens of empty apartment buildings and stores. However, the contrast between that and the ancient sites is incredible to see. 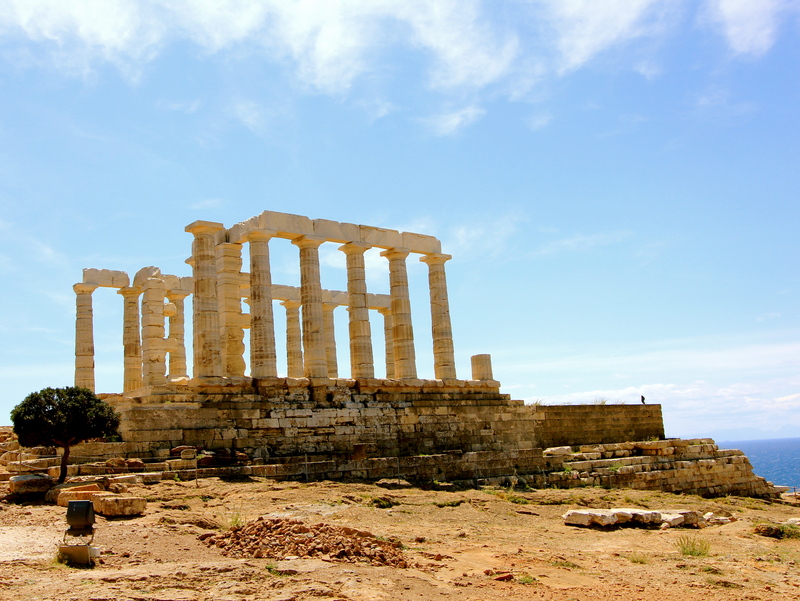 After our tour of the Acropolis, we had a fantastic Greek lunch before driving out the the Temple of Poseidon located on the Cape of Sounion, which is the southeastern most point of mainland Europe. 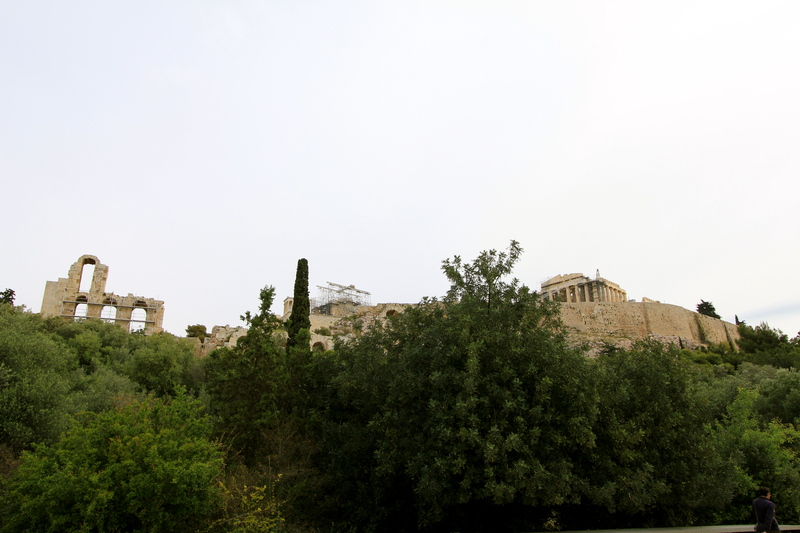 Getting dropped off at the bottom of the Acropolis and looking upward. I can only imagine what it looked like 3000 years ago, as a total white structure. 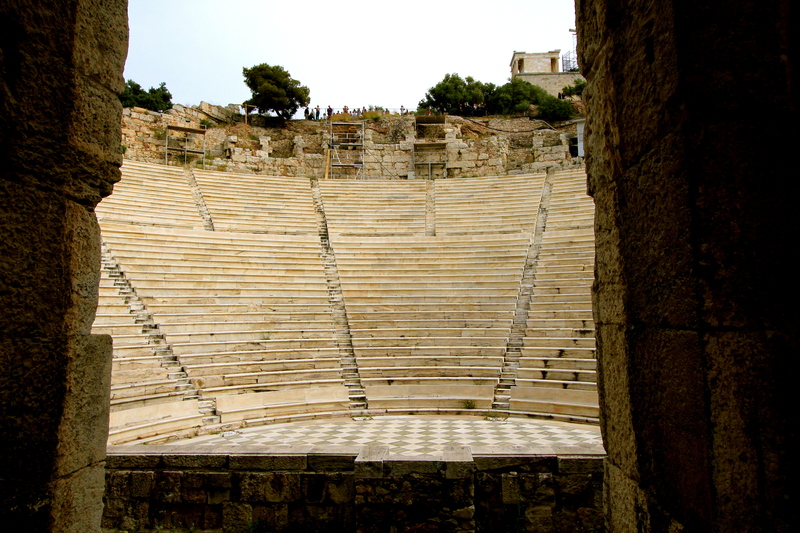 Just below the Acropolis is the Theatre of Dionysus Eleuthereus, and amphitheater that can seat 17,000 people. It is amazing the think that the famous Greek Philosophers like Socrates, Plato, & Aristotle would speak and hold court here. As we climbed higher, we could see a better view of the Amphitheater. 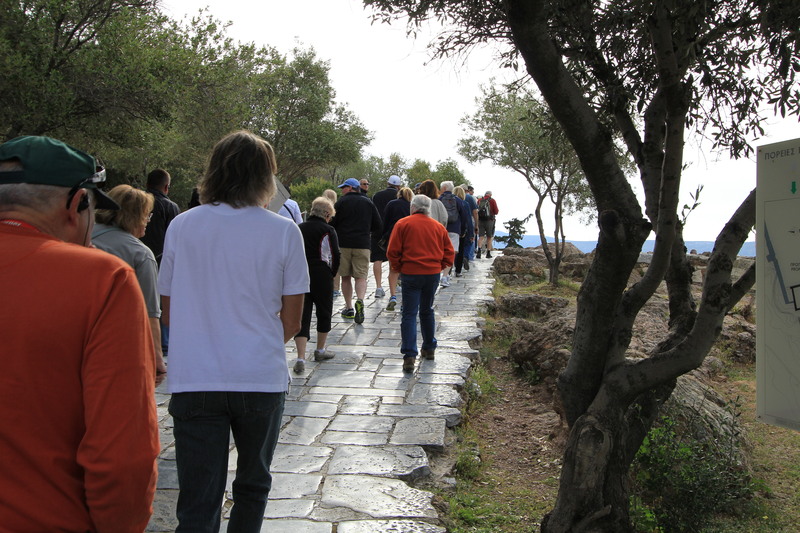 In reading about the walk up, we had read that the walk can be challenging with its incline and many steps. BUT, it is not as bad as it had been made out to be. The main thing is to watch your step, and if it does rain, the marble steps can get slippery. But, then again, given the average age of people who cruise, maybe it can be somewhat challenging to others? 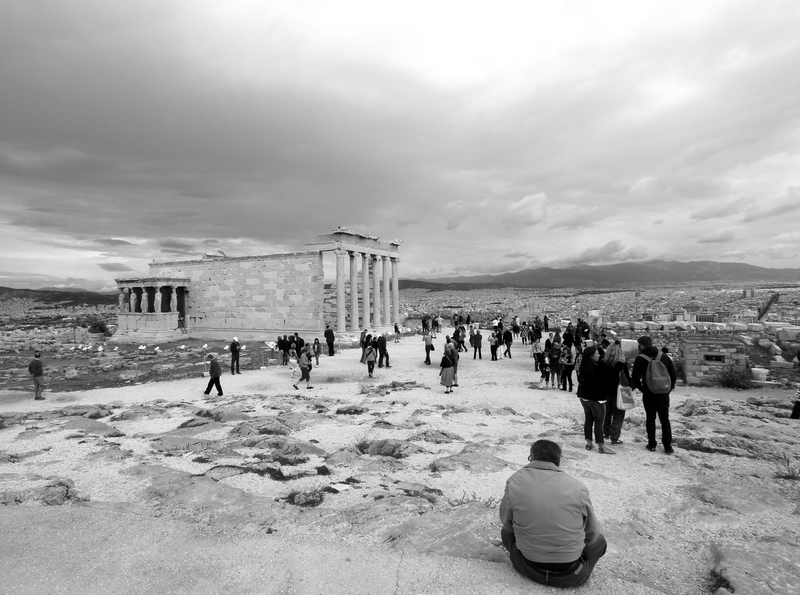 And, this is the final view at the top of the Parthenon, which is a temple to the Greek Goddess Athena (Goddess of wisdom, courage, inspiration, law, the arts, math, and justice). 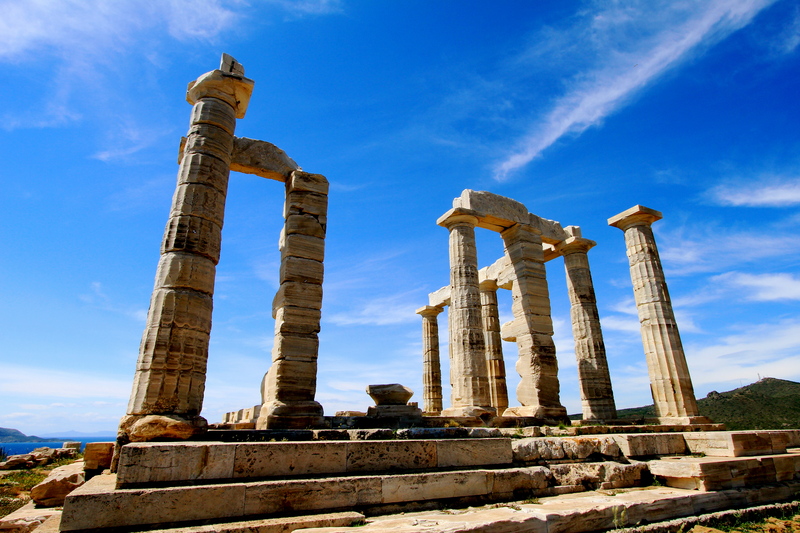 An extremely important God to the Greeks, and hence the namesake for the city of Athens. This once was a entirely white marble structure. 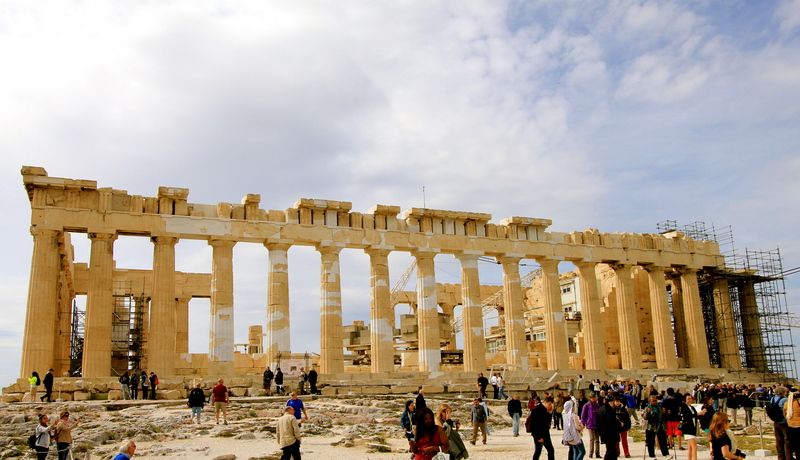 In the 1300s, the Ottomans had conquered much of Greece, and they used the Parthenon as an storage area for gun powder. The was a large explosion that damaged the roof of the building. The columns and architecture are studied and copied throughout the world for their intrigue detail and ability to hold up the structure. 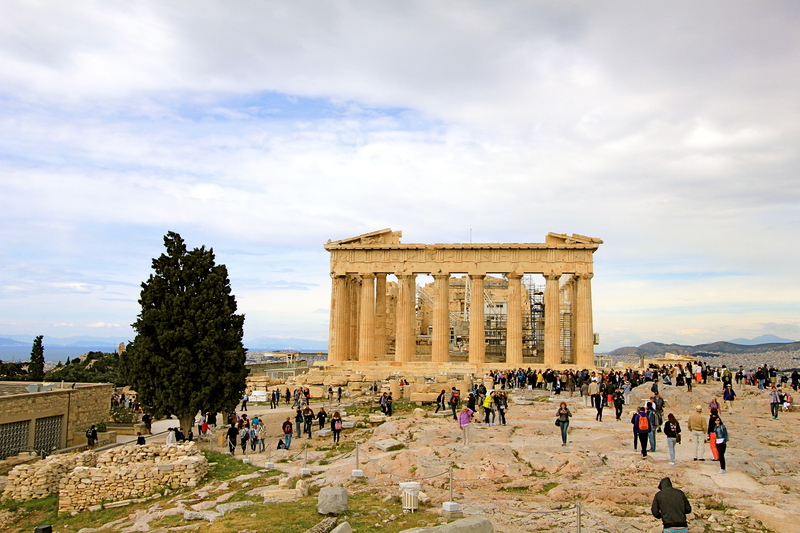 To the side of the Parthenon “The Erechtheum” that was built between 421BC and 407BC and is at the north side of the Acropolis. 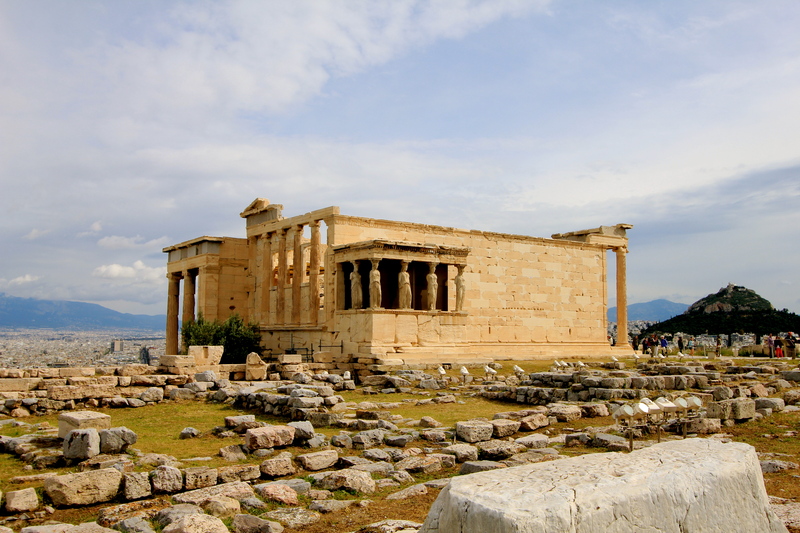 It is situated on the most sacred site of the Acropolis, legend has it that it’s the place Poseidon left his trident marks and where Athena’s olive tree grew during their competiton to name the city. 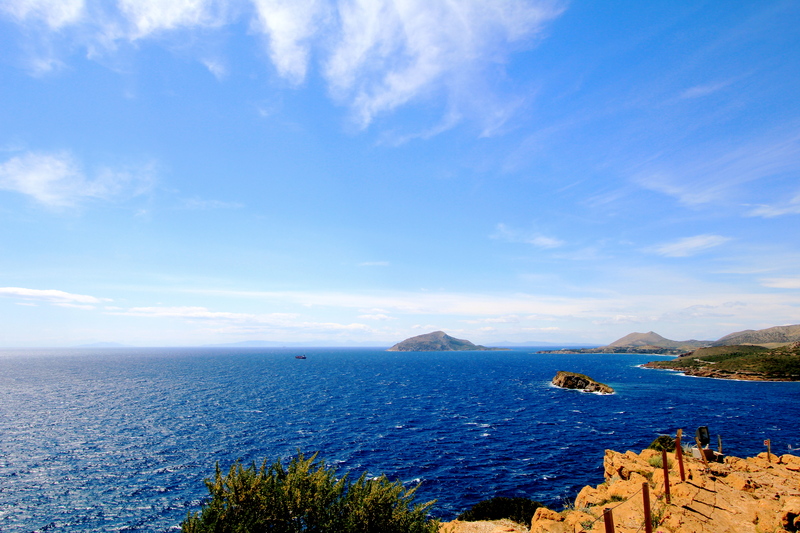 It is thought to be named after the legendry Greek hero Erechtheus, who according to myths was a king of Athens. 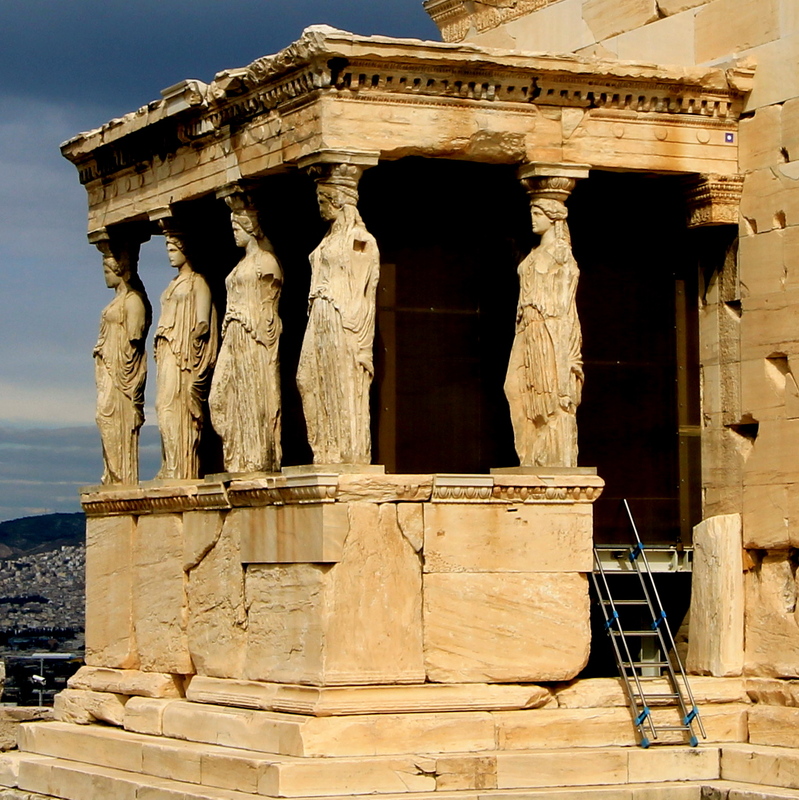 From an architecture standpoint at The Erechtheum is the porch of the maidens, with their heads supporting the roof of the structure. 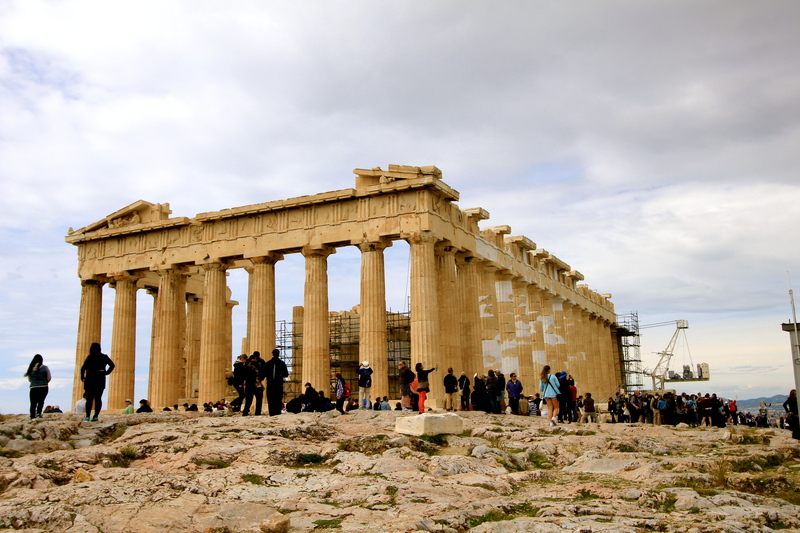 The Parthenon is 228 feet x 101 feet and was 40 feet tall, and once contained 46 total columns both inside and out. 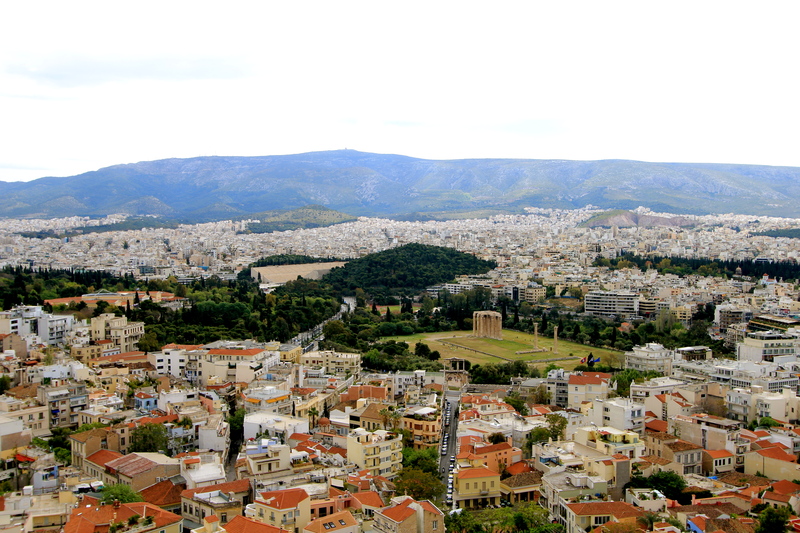 The city of Athens below…there is a more modern part of the city, but the modern area is fairly run down due to the poorness of the area and the high unemployment. 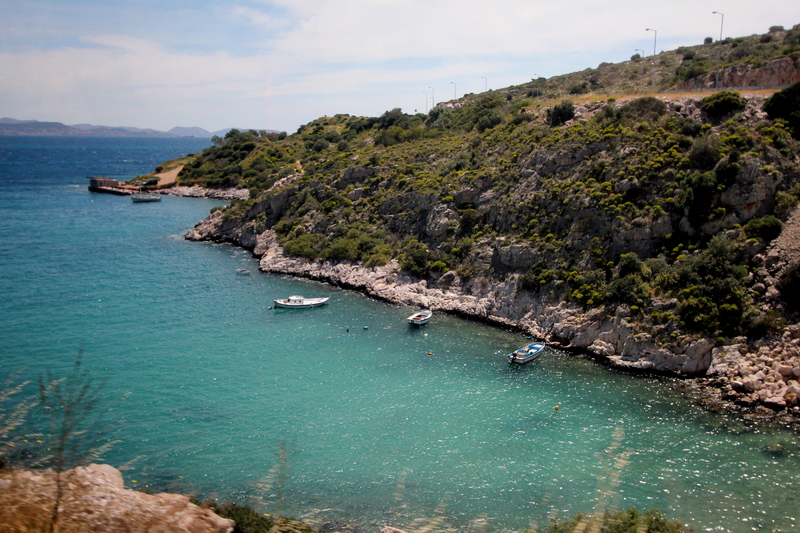 We then boarded our bus, and drove an hour south down the Cape of Sounion, which is the most south eastern part of mainland Europe. The drive is very similar to driving through Big Sur, California — just the mountains are not as high. 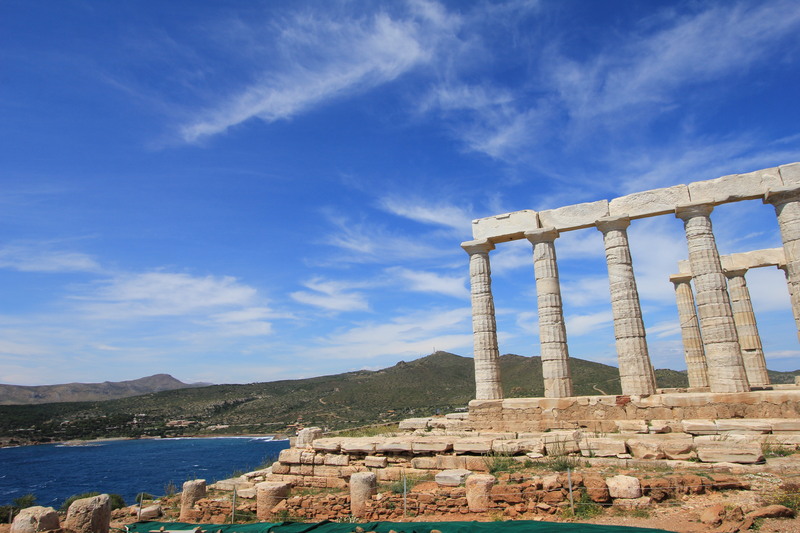 The attraction here other than the beauty of the landscape is the Temple of Poseidon (Greek God of the Sea). 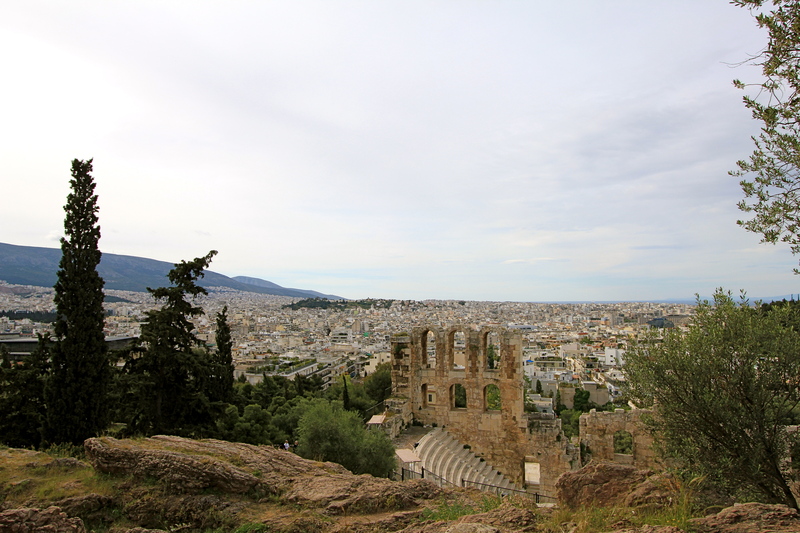 Built about the same time as the Parthenon in 300 BC, this area was used as both temple, and a lookout for invading armies heading toward Athens. 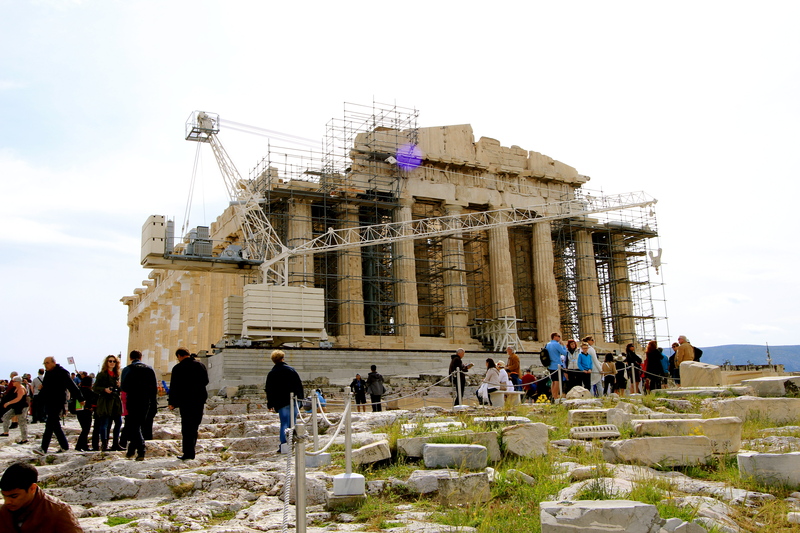 Like most ancient structures…this too was damaged by earthquakes. Standing with the Temple to our back, this is a most magnificent view of the Sea, which partly explains the location of the Temple to not only pay respect to their God, but to also be used as a lookout for invaders heading to Athens. And, that is how we crossed a site off our bucket list….